Lit Cosmetics: They offer 4 different sizes and 4 different varieties of their glitter. I also need to get their glitter adhesive as well. Royal & Langnickel: SILK GreenLine™ was developed for eco-friendly brushes without sacrificing the luxurious feel and precision of natural professional brushes (100% bamboo handles and chrome plated nickel ferrules). Model in a Bottle: Model in a Bottle® Setting Spray will hold foundation and eye make-up in place throughout the day and into the night. This product is resistance to smudging, tears, humidity and water. Model in a Bottle Long Lasting Eyebrow Sealer won't dust, shine or flake. It is easily removed with warm water and your favorite cleanser. Faceatelier Cosmetics: Facade makes creams obsolete as its one-of-a-kind, silicone-based, liquid-to-powder formula provides translucent, non-streaking, buildable matte color that sets with a natural glow. Eve Pearl: High Definition Foundation provides skincare with our CosmeNutrients® and sheer to full coverage in one step! I will also be re-buying my Beauty So Clean bottles & OCC lip tars as well! Cinema Secrets / SKS Novelty Co. Ltd.
Graftobian / SKS Novelty Co. Ltd.
Wow! 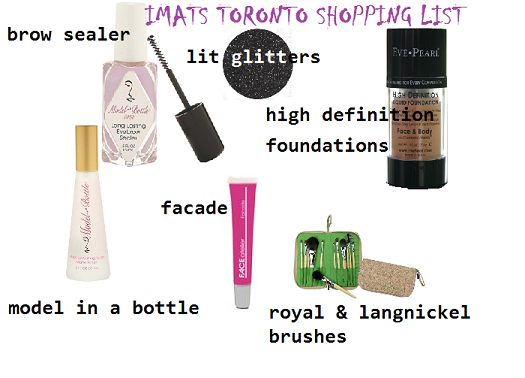 Great choices :) My list as of right now includes: Dinair Airbrush System, MUFE Aqua Creams, NYX Lippies and more! Oh btw, I'm going on Saturday morning. Hope to see you there! I hope you have a great time Jenn! nars and nyx that's the two I would loveeee to see!